Guest Session was organized on 23rd January, 2016 for the PGDM Students on the topic 'Issues and Challenges in Sales and Marketing'. 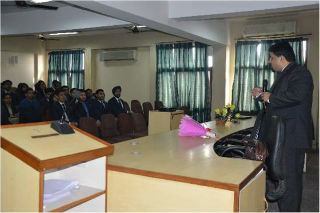 The speaker was Dr.Amit Pareenja, Business Development Manager, Vodafone Global Enterprise. Dr. Pareenja is Ph.D, MBA and MCA besides having several other certifications in computers and management. He has earlier worked in different capacities in organizations including IBM-Lenovo, Tata Communications and Reliance Communications and has also authored a book for IGNOU curriculum. The speaker shared his experiences of working in sales in different capacities and in various organizations. He explained to the students the skills and traits that are essentially required to succeed in the field of sales and marketing. The students were told about the current scenario in the telecommunication industry, the main competitors and the strategies being adopted by them to garner major market share. Dr. Pareenja discussed the various challenges that are faced by the companies as well as the sales person in the market place. Students interacted with him throughout the session by seeking clarifications and raising queries. Overall it was an extremely interactive and informative session for the freshers who are seeking career in the field of marketing.